Prometheus started filming a while ago- right at the time we were in preproduction on PACIFIC RIM. The title itself gave me pause- knowing that ALIEN was heavily influenced by Lovecraft and his novella. This time, decades later with the budget and place Ridley Scott occupied, I assumed the greek metaphor alluded at the creation aspects of the HPL book. I believe I am right and if so, as a fan, I am delighted to see a new RS science fiction film, but this will probably mark a long pause -if not the demise- of ATMOM. The sad part is- I have been pursuing ATMOM for over a decade now- and, well, fter Hellboy II two projects I dearly loved were not brought to fruition for me. The good part is: One project did… And I am loving it and grateful for the blessings I have received. That one project is, I believe, “Pacific Rim”, a film about an alien invasion that is fought with huge battle robots piloted by humans. Kinda makes me think of the Gundam cartoons. Which would explain why making At The Mountains Of Madness so soon after Prometheus might be a bad idea. 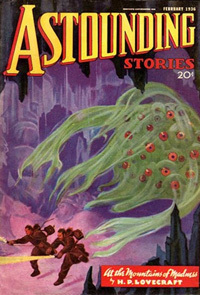 Though I agree with one of the his fans that with all these ancient alien invasion flicks, wouldn’t now be the best time for the Lovecraft film? It is a tricky question to answer in the vain that no one wants ATMOM to fall in line with with the rest, and not stand alone as a masterpiece, as Lovecraft’s novel is. So for now, no Shoggoths, Elder Things, or large blind penguins. This entry was posted on May 8, 2012 by David Joseph. It was filed under Strange Reports and was tagged with At The Mountains Of Madness, Guillermo Del Toro, H.P. Lovecraft, Pacific Rim, Prometheus.